Publisher: New York: Abrams Books for Young Readers, 2007. Opening Sentences: Sam was a library mouse. His home was in a little hole in the wall behind the children’s reference books, and he thought that life was very good indeed. Synopsis: Sam comes out of his hole behind the books after the library closes for the day, and reads voraciously. All the books he reads fill him with wonderful imaginings and ideas, so he decides it’s time to write his own book. After carefully putting together some pieces of paper, he writes and illustrates his first book, and sets it where a boy finds it the next day. Sam writes another, and another, and soon his books are so popular that everyone wants to meet the author. Sam is shy, though, and besides, he’s a mouse. But he doesn’t let the kids in the library down. They DO get to meet the author. When they arrive at the library the next day, there’s an empty tissue box on a table, with a banner above it (taped to two pencils) that says “Meet the author!” There’s an arrow pointing down. Through the hole in the box, they see their own face reflected in Sam’s mirror. There is a pile of blank booklets beside the box. Every child gets a chance to write and illustrate a story. 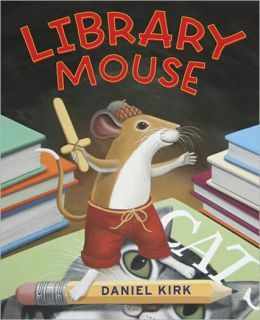 Activities/Resources: The best activity to go with this book is to staple together some folded pieces of paper, and have kids write and illustrate their own books, just as Sam the Library Mouse did, and just as the kids in the library did. There is a great activity page on Daniel Kirk’s website, including instructions for making little books for kids to use when writing and illustrating their own picture books. To find ways to make libraries fun, check out the Library Games website that aims to turn librarians into FUNbrarians. Availability: Readily available in hardcover. There are also other Library Mouse books: Library Mouse: A Friend’s Tale; Library Mouse: A World to Explore; Library Mouse: A Museum Adventure and Library Mouse: Home, Sweet Home. Very cute and clever story. Love the idea of having the kids write and illustrate their own books. That would make a fun event. Thanks, Beth. I read this book, and loved it. Great choice, Beth. And what’s more fun than writing your own book??? Ha! I would get this one today … if there was a little less snow on the ground. Putting it on my library list. What a wonderful built in craft too. This looks like a fun one for a gift too. I’m writing my Christmas list. I LOVE Library Mouse!! I like your activity ideas and links as well. Thanks! This really is a classic and so beloved. I’m glad it’s been added to the list. Many people will find this a valuable book. Thanks! I love this story but didn’t realize there are so many lovely sequels. What a clever story. I just love this book and will seek it out. I love that the shelves are filled with books written by those who visit the library! Great share!